Digital Sign and Kiosk marketing is saving businesses thousands of dollars. Learn how you can use this technology to better serve your customers and save money. Digital signage and interactive kiosk systems are a fast growing marketing segment. Having a platform that gives your client information before they ask is a powerful way to both service and market to your customers. Digital Sign -vs- Kiosk, What's the difference? I am glad you asked. Although the can share some traits in booth function and looks, Digital Signage and Kiosk Systems are two very different things under the hood. They have different use cases and benefits. Let's start with Digital Signage Systems. A digital signage system consists of one or more displays that are updated with information by use of a specialized computer called a media player. The key thing to remember here is that although each display may have its own media player, the information fed to these displays could be identical or it could be entirely different. Digital Signs have a variety of uses from menu boards in fast food restaurants to advertising displays in retail establishments or message boards in schools, hospitals or office environments. Digital signage systems are schedule based. Content gets delivered to each media player based on the schedule for that particular player. For instance, a restaurant's menu board could change from lunch selections to dinner choices automatically at 4 pm every day. That is a very simple example, and some schedules can be quite complicated taking into account the day of the week, the time zone, and the location of the display. Digital Signage platforms usually run in the cloud, and their content is created and controlled from a central location even though the displays can be anywhere in the world. 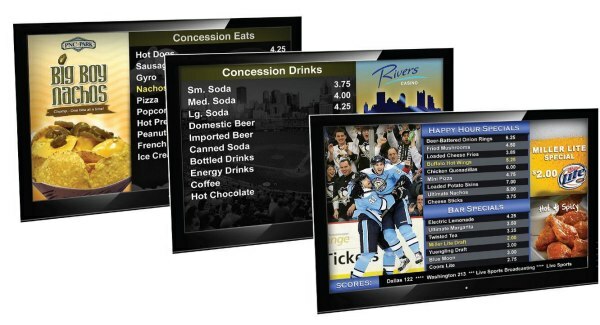 If you would like more information on digital signage systems and how they can help your business save money and better service your customers, contact the digital signage professionals at Cotts, Inc.
Kiosk Systems in some cases may look like a digital sign, but they are an entirely different animal altogether. Kiosk systems are interactive, which means they can respond to input from the user. Kiosk systems vary from simple kiosks that play a pre-recorded video in a museum to incredibly complex systems that can take payments, dispense tickets or products or even money. An ATM is a form of a kiosk system. Most kiosk systems are used to give customers information. Building directories, mall directories, interactive information kiosks in museums, art centers and tourist areas that allow users to see more than just the first screen of content are examples of kiosks. Most modern kiosk systems use touch screens to enable users to select options from a menu system. On the inside, modern kiosk systems usually run on specialized computers with solid state storage for reliability. They can be totally stand alone, but today, most can be updated with new content remotely. If you would like more information or advice on interactive kiosk systems get in touch, we will be happy to go over your use case and develop the perfect kiosk system for your business. There are many variables to consider, but in most cases, it comes down to interactive, self-service, or not. If you need the ability for your customers to choose the information they want, or the ability to get to a piece of information directly, then a kiosk system is more in line with those goals. If what you want is a static information display that shows content one page after another on a predetermined schedule, then a digital sign is a better fit. Contact us to discuss your ideas and we can help you decide exactly what will best serve your needs.